O’Donnellan & Joyce had 22 houses on view to the general public last Saturday for its forthcoming auction on March 14. According to Colm O’Donnellan of O’Donnellan & Joyce there were unprecedented viewings last weekend with potential purchasers coming out in force. A total of 26 properties will go under the hammer on the day and the auction is beginning to cause a huge stir in the market. The auction will feature a mix of residential and commercial property and land, with properties located across Galway city and county as well as a number in Co Mayo. Several of the properties going under the hammer are ideal city family homes. Two of these are located on Taylor’s Hill, including No 13 St Claire’s, a substantial four/five bedroom residence with a modern finish throughout. The property has an AMV of €550,000. The second property is St Margaret’s on Taylor’s Hill, a magnificent detached residence offering an abundance of character and style and a fantastic private rear garden. This is being advertised with an AMV of €550,000. Another attractive family home, and very suitable to a first time buyer, is No 86 Grattan Park, Salthill, Galway, a three bedroom semidetached residence located just off the Salthill Promenade. 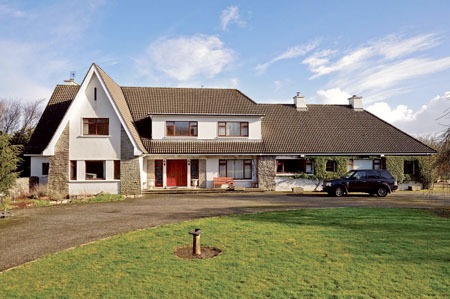 This property has an AMV of €195,000. The next city location is No 33 Ard na Mara, Salthill, an excellent three bedroom semidetached residence with a one bed apartment to the side. The property stands on an attractive corner site and is on the market with an AMV of €335,000. For anyone who enjoys DIY, No 44 Cruachan Park in Rahoon is the property for you. This four bedroom home offers excellent potential with an AMV of €130,000. A unique residence only a short drive from the city and within moments of Barna village is a thatched property at Furrymelia, Barna, which requires some upgrading and is being offered with an AMV of €185,000. There are a number of city properties which would be ideal investment properties such as a one bedroom apartment at Ce na Mara overlooking the Docks with an AMV of €110,000, and a terraced residence at No 13 Henry Street for €150,000, as well as a property on the east side of the city at No 26 Ballybrit Court, which has been converted into two, two bedroom apartments going for €95,000. Also on the east side of the city is a property at No 26 River Grove, Oranmore, with an AMV of €110,000, a residence at No 5 Rockland Avenue, Ballybane, with an AMV of €48,000, an end of terrace residence at No 60 Fearann Ri, Doughiska, for €65,000. Two very impressing properties on offer on the day are Mount Foran, Oranmore, and Lissadyra House, Tuam. Mount Foran is a detached• residence on four acres with an adjoining farm of 46 acres. This property will be sold as one lot or as two individual lots. The AMV for the residence on four acres is €395,000, and for the 46 acres is €550,000. The residence at Lissadyra, Tuam, is a period home on 1.14 acres with an adjoining 28.286 acres of prime agricultural land. The property will be sold as one lot or as two individual lots. The residence has an AMV of €210,000, while the land is being offered at €195,000. The Central Tavern in Loughgeorge, Claregalway, is sure to attract huge interest on the day. This is a well known and high profile premises that enjoys a huge passing trade and was once a thriving business. It is on the market with an AMV of €285,000. There are two other commercial premises on offer, one at Milltown, Tuam, comprising a terrace with both commercial and residential potential with an extremely attractive AMV of €50,000; and a commercial unit at Millrace House in the heart of Tuam with an AMV of €18,000. If you are looking for a family home in the country there are two on offer — a four bedroom bungalow in Clonboo with an AMV of €170,000, and a four bed bungalow in Colemanstown, Ballinasloe, with an AMV of €70,000. This is an auction that has something for everyone and all properties are open for viewing with no appointment necessary. Contact the agent or visit www.odonnjoyce.com for full details. Contact the auction team in O’Donnellan & Joyce at (091 ) 564212.